The railways stations Lille-Europe and Lille-Flandres, situated in the centre, are served by high-speed train. Lille is linked to Paris (1hour), Brussels (38mn), London by Eurostar (1h40). 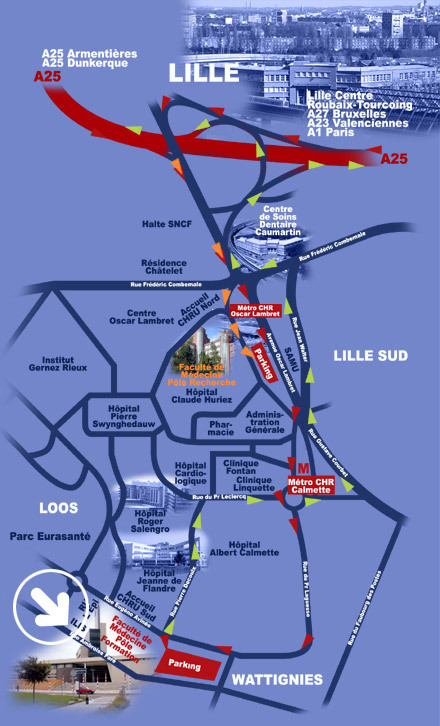 Lille airport is situated at 10km from Lille in Lesquin. It has daily flights to many destinations in France and Europe. Every day there are sheduled flights within France. Direct services to the major regional capitals : Bordeaux, Clermont-Ferrand, Lyon, Marseille, Montpellier, Nantes, Nice, Strasbourg, Toulouse. Links with connecting flights to the following major towns : Ajaccio, Angers, Bastia, Biarritz, Brest, Calvi, Figari, Le Havre, Limoges, Lorient, Metz/Nancy, Mulhouse, Pau, Rouen, Toulon. The major European metropolises are served daily by return flights on the same day : Barcelone, Berlin, Bologne, Francfort, Genève, Lisbonne, Madrid, Milan, Munich (direct), Naples, Porto, Pragues, Rome, Zurich. A shuttle provides transfers to and from the Lille-Europe railways station. 18 return trips a day : from 5.00 am to 10.30 pm Monday to Friday (during the week-end following the flights). Travel time : 20 minutes.